Eco-artist Ann Wood of Brooklyn creates all sorts of wonderful things from found and salvaged bits. 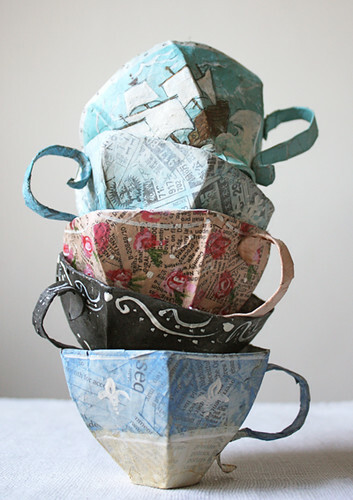 After seeing the Wedgewood-reminiscent paper cups that were featured on Design Sponge recently, I remembered Ann's popular instructions from about a year ago for making paper mache teacups... actually it was this photo of pretty cups all stacked up that stayed with me. Ann's tutorial is very thorough and I've had it in the back of my mind to give them a go... she makes the process sound easy and a lot of fun too. Oh, once again... I LOVE these :) My hubbie wouldn't understand of course, but they are delightful! Oh wow - I lurve these cups - perfect for a mad hatter's tea party or the centerpiece of any whimsical party theme... yet another thing to add to my 'to try' list; so much to do and so little time!! So pretty! The tutorial looks easy and sure will give it a try.Tissue paper lettering looks so good too. Had seen that photo of the stacked paper teacups, too. Fascinating! Then I took a peek at the link you shared for "mod pods" by Dream a Little Bigger. So creative!